A Google News search for “frivolous lawsuit” brings back about 2,400 results. Scrolling through the first few pages indicates that most of these lawsuits have to do with politicians and ex-politicians at every level of government. There are others as well, however, involving businesses and business leaders, teachers and school districts, religious minorities, and others. Not having read every article, I will not weigh in on which if any of these lawsuits are truly frivolous and which if any have merit. I will say, however, that America seems to be a lawsuit-happy place. As one comedian observed, whenever you see an apparently unnecessary warning label on some product (do I really need to be told that hot coffee is hot? ), you can guarantee that someone somewhere did something stupid and tried to sue the company for it! Such lawsuits often say more about the intelligence and character of the plaintiff—or lack thereof—than the guilt of the defendant. And so it was in ancient Corinth. The Corinthian believers had taken to suing one another in civil court. This situation was completely unacceptable to Paul, who strongly believed Christians ought to be able to resolve their disagreements privately. That is what grown-ups do when interpersonal conflict arises, especially when they are brothers and sisters in Christ. • Why does Paul fear Christians suing each other will result in “shame” (v. 5) for the church? • What biblical principles can help believers settle their disagreements in a Christlike manner? The life of the body is grounded in the transcendent, but it is exercised in the world. Paul sees the life of the body as a vital mutual, continuing process whose proximate end is maturity in the graces (Phil 4:8-9), valor in the moral struggle (Eph 6:10-20), and whose final end is glorification and eternal life with him in whom we are given this great salvation (I Cor 15:51-53), this cosmic freedom (Rom 8:18 21). This is the vital, mutual, continuing process by which the church becomes what in the design of God it is. There are affinities here, especially for two other metaphors: (1) the vine, emphasizing the location of the church’s root in Christ and the production of her fruits through continued association of the branches with the vine (John 15:1-11); and (2) the temple or building, in which we are being built into a “spiritual house,” to function as a holy priesthood, to offer “spiritual sacrifices” acceptable to God in Christ— in short the church as a place of organic life (“living stones”), of celebration (“spiritual sacrifices”), of proclamation (“declaring the mighty deeds”), and divine approval (“now you are God’s people”) (1 Pet 2:4-10). Such metaphors—that of the body plus these used to extend its meaning disclose a corporate life in which God’s people, Christ’s body, is held together in a common life “over which Christ rules, and through which a new creation emerges, a new humanity in Christ” (Minear). Paul coins a phrase with which to characterize this koinonia or communion of life: being “in Christ” (Gal 2:20) and so built into one another through the receiving and sharing of agape. Here is the ground of the church’s unity: Christ is not divided, and those who are “in Christ” are united in Christ—they form his body as members, they were baptized in his name (1 Cor 1:13). Party-spirit, faction, over confidence in one’s own understanding of the gospel, all divide and threaten Christ’s body. The Eucharist (1 Cor 10, 11), as the sign of this unity, is a sharing in one loaf and one cup. Done in faith, in a state of agape with one’s neighbor, it is participation (koinonia, Vulgate participatio) in the life and redemptive self-giving (the body and blood) of Christ. concern may have rooted in the notorious reputation such courts had for dispensing “justice” only to citizens of higher standing and wealth. In fact, persons lacking citizenship could not bring charges at all, and persons of lower status were hindered in suing those of higher rank. The result was a system that provided a means for persons of power to take advantage of those possessing less or no power. Thus, Paul can be viewed here as criticizing those higher-status members of the church who used the corrupt court system to press claims against other members, resulting in “wronging” and “defrauding” their “brothers” (6:8). The term Paul uses in 6:7-8 (apostereo) can be used to mean “rob” or “deprive financially.” Paul’s inclusion of the “greedy” and “robbers” in his list of unacceptable behaviors in 5:10-11 and again in 6:10 may reflect his concern with more powerful members using the courts to exploit those of lesser status. 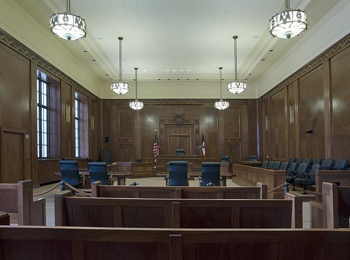 Perhaps, though, it was not the reputation of the courts that concerned Paul as much as the damage such court cases might inflict upon the reputation of the church. Even if legitimate grievances were handled in a just fashion, the fact that church members sought justice in the public arena could tarnish their identity as a different kind of community. Paul’s argument focuses on the capacity and responsibility of this community to handle its own affairs. Conceivably here, Paul may have in mind a specific instance rather then a recurring practice. The “defrauding” of one member by another may have preceded and precipitated the resorting to the courts. If such were the case, then Paul has three targets: (1) the person guilty of the initial action, (2) the person who chose to seek justice through the court, and (3) the church as a whole for allowing this matter to be taken outside its boundaries rather than resolving it within. divisions seemed to have crystallized around eloquent teachers in the church who competed for the loyalty of the members. The strife (eris) that had come to characterize their behavior inside the church (1:11) may have spilled over into the public forum as teachers sought competitive advantage through legal means. The end result of such cases was typically increased enmity between the parties involved and their supporters. Paul’s view, if this is his concern, is that such litigation results in a “lose-lose” situation for all involved: “In fact, to have lawsuits at all with one another is already a defeat for you” (6:7a, NRSV). Instead, they should willingly endure being wronged or defrauded rather than inflict the same on another believer (6:7b). Robert Scott Nash, 1 Corinthians, Smyth & Helwys Bible Commentary (Macon GA: Smyth & Helwys, 2009), 154–55. Summed up very nicely for this adult Sunday School teacher. Statements in this article made it much easier for me to put together an understandable presentation of Paul’s intentions in this week’s scripture passage.